With Wednesday hockey at Brit on hold until after the Olympics, Polka King and I got our mid-week hockey fix at Richmond Ice tonight. I used to be a regular on Thursday nights here until my son was born. Of course, playing Thursday hockey was not an option when other commitments take precedent. However, when I was asked out of the blue last week to play goal in Richmond, I jumped at the chance. Hey, I haven't seen these guys in nearly 5 years and I really needed the exercise. However, in my twisted world, the most important thing was that now I could take advantage of the late night eats in Richmond! Yes, we've exhausted a fair b it of the late night eats in Vancouver already... Time to move on. So honestly, where to eat after hockey? There are the usual Hong Kong-style cafes and such. Hey, how about that Korean restaurant right beside #9? I was curious about it the last time I spotted it and with Polka King on board, we headed over to Lansdowne Centre. Gosh, the place was quite busy for a Thursday midnight. Turns out the good people from Samsung had taken up a good part of the restaurant. They are here for the Olympics and by the sounds of their chatter, they were also here for the booze! They seem to know how to party it up! At first glance, the menu seemed quite consistent with any other Korean restaurant except for 2 things. First, there was an AYCE late night BBQ. Uh... No. Second, there was this special for $19.95. Initially, we were a bit confused. It stated we could pick any 5 items for $19.95. Wait a minute, 5 dishes? That seemed like an incredible value. This menu is apparently available for lunch and late night after 9:00pm. We weren't all that hungry; yet, the deal seemed just too good to pass up. 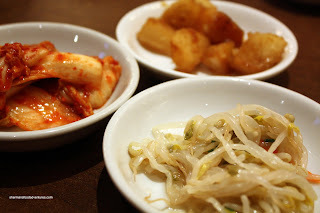 As per usual, we got the complimentary Banchan prior to receiving our dishes. It consisted of Kimchi, Stewed Potatoes and Marinated Bean Sprouts. Of the 3, the potatoes were a definite miss. They were way too soft and practically falling apart. Not aesthetically pleasing to look at or to put in our mouths. We got the Bibimbap to start and it certainly looked pretty good. Sure, I would've preferred the Dolset Bibimbap but again, for $19.95, I wasn't complaining. The toppings were plentiful; however, the rice was quite mushy. At the very least, it was served hot, not stone-cold like the one from Norboo. Although the Seafood Pancake was not served on the usual cast iron plate, it was texturally quite nice being fluffy in the middle a bit crispy on the outside. In fact, without the plate, it turned out to be less oily. In terms of seafood, I didn't notice much other than the imitation crab meat. So it was a decent pancake without seafood. At first, when we saw the 5 items for $19.95, we figured that the dishes would be smaller versions of regular-sized portions. The Japchae certainly fit that description being quite small. Hey, I don't blame them for not giving really large sizes considering the price. But my point is that most of the dishes are pretty decent in portion size, which is a good thing. 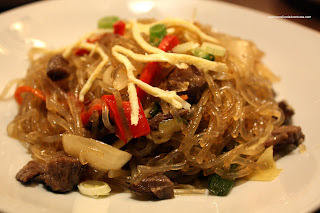 As for the Japchae itself, it was alright, the noodles were a bit softer than we would've liked. Furthermore, it was a bit bland. Although it did have a nice sesame oil aroma. 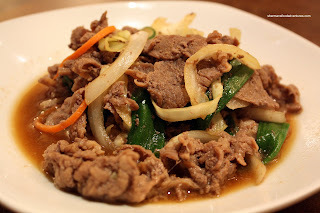 Our plate of Bulgogi was probably the most disappointing dish. The meat was tasteless and quite chewy. Our last dish was the Pork Bone soup. I really liked the large meaty pieces of pork bone. The broth was slightly spicy and a bit sweet. A nice dusting of perilla seeds added aromatics to the soup. We barely finished all the food we were presented with. The 5 dishes for $19.95 is a very good value. Okay, the good deal does come with compromises. The food itself was pretty average. 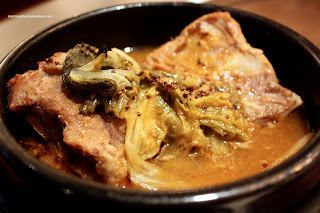 It doesn't stack up to the really good Korean restaurants such as Hanwoori and Insadong. However, for a late night meal, you can't really beat this offer. Moreover, the service was actually quite friendly, albeit sparse. In terms of the regular menu, I wouldn't pay the regular prices for the food though. that seafood pancake looks really good. on the regular menu, does it come with more seafood? i'm thinking of shrimp and scallops being very tasty in there. The last time, I tried this cramped tiny place, their beef shortribs bbq, seafood pancake and tofu spicy soup were ok. I won't disagree with you there. I never expect any seafood in my pancake at Korean restaurants. There are the odd places that do it right and have oysters and such in it. But rarely. More often than not, you get a fried "pancake" soaking with enough oil at the bottom to put Pizza Hut pan pizzas to shame. 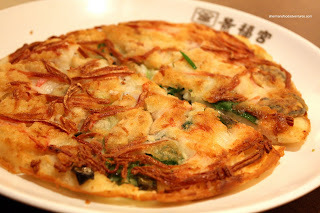 I find Insadong's pancake acceptable. The one here had no seafood at all. EnbM, I have meant to try Happy Day Korean but there is something that tells me "no, don't go!". Well, aside from the smiley face outside (think Watchmen), there is some sort of ghetto/uninviting look. I mean, was it really necessary all the dark tinted windows? But, if you think there is something beyond that, let me know (as well as the dish I should order)! Thanks for the tip, Sherman, I shall remember to order the pancake next time I'm at Insadong. As for Happy Day, I'm with Kim, it looks scary, but I'm willing to give it a try. 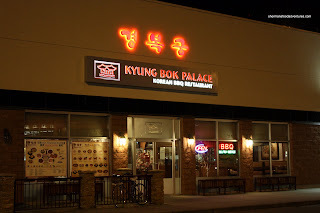 Yu Na Kim probably won't eat at Kyung Bok Palace... Hehe... not good enough! She won't be left alone here, everyone knows who she is! I was not impressed when I came with my korean class. The food was mediocre or cold at best. 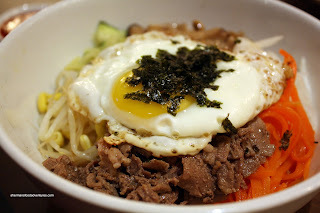 I figure I can get much better value/quality food at regular korean restaurants. The seafood pancake at the korean restaurant in Aberdeen is even better than this. Korean class? You teach Korean? Oh yah I totally agree. If it weren't for the special, I wouldn't pay full price for this food. There is much better elsewhere.